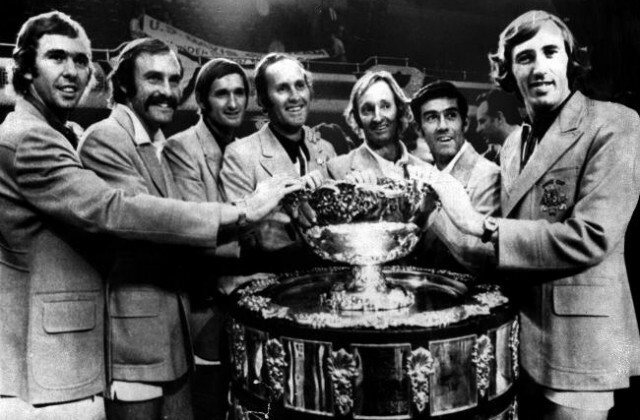 “The ITF, in a rare burst of sense and forgiveness, announced in 1973 that all pros were now eligible for Davis Cup. She’ll be apples! That’s an old Aussie expression for good days ahead. And I got the Davis Cup itch again after years of feeling it was no longer for me. Why not? But, realistically, I was 35, not at my very best, and for a very long time hadn’t been involved in the most stifling of tennis pressure, Davis Cup – yes, greater than a Wimbledon final. Especially in Australia where so much success had raised expectations to the clouds. I hadn’t been on the team for 11 years, a lark, overrunning Mexico in 1962. But I was getting itchy to prove myself since the 1960-61 Cups were also romps, over Italy. The lone tough encounter of my four winning teams was the U.S. in 1959, and I lost both singles, to Barry Mac-Kay and Alex Olmedo. Only the presence of Neale Fraser, winning both singles plus the doubles with Emmo, saved us. Now I had to talk to Fraser, the successor as captain to Hopman. A good friend, but very practical. Was I up to it? And how would the other guys feel about a newcomer at this stage? They had won two series to lift the team to the semis. Happily, I was accepted by my mates: Newcombe, Rosewall, Geoff Masters, Ross Case, Mal Anderson. They just wanted to win for Australia. If I could help, fine. But could I? Fraser wasn’t at all sure. The acid test prior to the semifinal against Czechoslovakia was the Australian Indoor Championships in Sydney. Captain Fraser made it clear that I’d have to do well to have any chance to play against the Czechs. I worked my bum off to get fitter than I’d been in almost a year. The lineup of would-be Laver-flatteners was daunting. In the quarters, it was Raul Ramirez, the quick, sharp-volleying Mexican, and I got him, 6-3 6-4. Next, world No. 6 Rosewall. Where did they find him? I barely escaped, 6-4 3-6 8-6. Finally, it was No. 2 Newcombe, in a roaring five sets, 3-6 7-5 6-3 3-6 6-4. It couldn’t have been a nicer setting after gloomy, rickety Hordern Pavilion, site of the Indoor. We were in Melbourne for the semi, plenty of November sunshine heralding the onset of summer on the famed grass courts of Kooyong. The Czechs would have preferred clay, but Jan Kodes, a future Hall of Famer, could handle the lawn. He’d won Wimbledon and was finalist to Newcombe at Forest Hills only months before. For the last time, my parents saw me play, and fortunately I didn’t let them down. Or Fraser and the country. It was extremely difficult, though. After I stopped Kodes, 6-3 7-5 7-5, Jiri Hrebec, wildly erratic, put it all together to stun the crowd as well as Newcombe – on grass! – 6-4 8-10 6-4 7-5. Now Rosewall and I were on the same side for a change, and we needed each other in a long, demanding go-ahead doubles over Vladimir Zednik and Kodes, 6-4 14-12 7-9 8-6. That left it up to me to tame Hrebec (seldom heard from again) 5-7 6-3 6-4 4-6 6-4 settling it. We were on our way to Cleveland, a quartet called, by my co-author, “Captain Fraser’s Antique Show” – Rosewall, 39; Laver, 35; Mal Anderson, 38; Newcombe, 29. Rosewall had been away from Cupping for 17 years, Anderson for 15, Laver, as I said, for 11, Newcombe for six, Fraser for 10. Never been anything like it. We were old enough to go out alone, but nobody wanted to in the December chill of downtown Cleveland. What a place for a Cup final. Old, vast, drafty Public Hall, attracted few people to see us do our stuff: a 5-0 triumph that ended the U.S. streak of five years and a record 15 encounters. A terrible promotion. 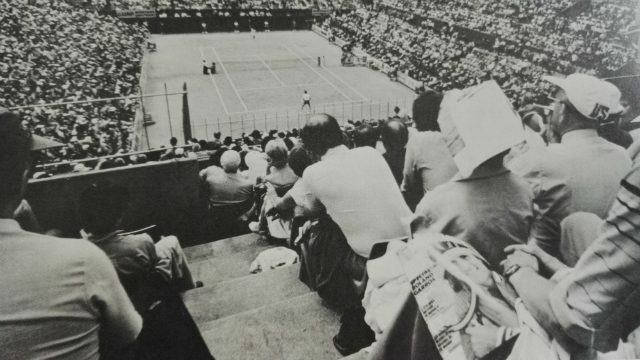 Some writers were calling us the greatest of all Davis Cup teams, yet nobody wanted to see us (maybe 7,000 for three days) or the home heroes. It didn’t matter to us. We wanted Yank heads to show that the, shall we say mature, Aussies were still breathing. And we got them on an overly drawn out Friday night and a brief Saturday afternoon. Newcombe led off with a mixture of uncharacteristic spins, soft stuff, plus his usual muscle to overcome Stan Smith in five 6-1, 3-6, 6-3, 3-6, 6-4. Then Tom Gorman and I went at it furiously, charging the net, serving and-volleying for five more sets. A bit of revenge for Wimbledon ’71 was mine, 8-10 8-6 6-8 6-3 6-1. Watch out Australia’s winning team of 1973 reflect on their famous 5-0 victory over the United States in Cleveland.